Last month we said 2013 wouldn’t disappoint in the battle of the top three browsers, and boy were we right. 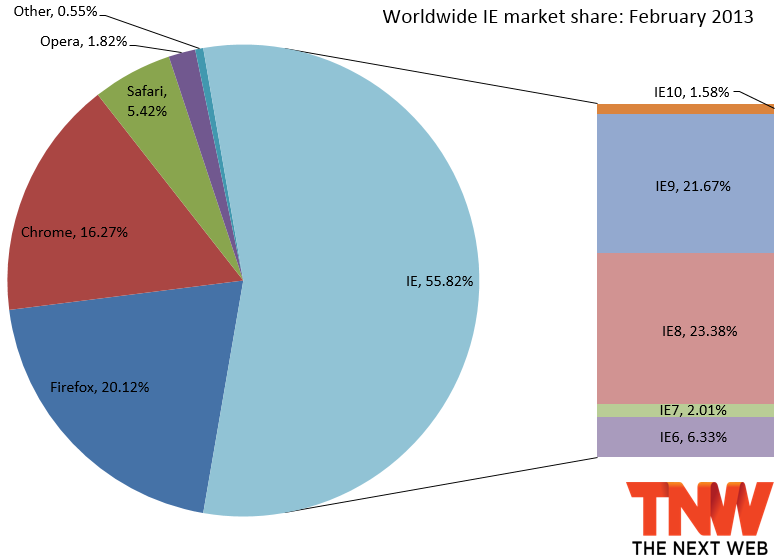 February was the fourth full month of IE10 availability as well as when new versions of competing browsers launched in the same week: Firefox 19 and Chrome 25. The latest market share numbers from Net Applications show that Chrome is so far still the only loser in 2013. Between January and February, Internet Explorer gained 0.68 percentage points (from 55.14 percent to 55.82 percent) and Firefox was up 0.18 percentage points (from 19.94 percent to 20.12 percent). Chrome meanwhile fell a huge 1.21 percentage points (from 17.48 percent to 16.27 percent). Safari was up 0.18 percentage points to 5.42 percent and Opera picked up 0.10 percentage points to grab 1.82 percent. At 55.82 percent, Internet Explorer is still growing. January was the first time the browser went back above the 55 mark in a long time, and February showed it won’t be losing that crown just yet. Despite Windows 8’s release and gains, however, IE10 continues to have a hard time pushing things forward. At 1.58 percent in January, the browser gained just 0.29 percentage points last month while IE9 recovered after its first loss in January, propelling to 21.67 percent (down by 0.74 percent percentage points). There is some good news for IE10 though, it’s available for Windows 7 now, so we should see some accelerated growth in the coming months. 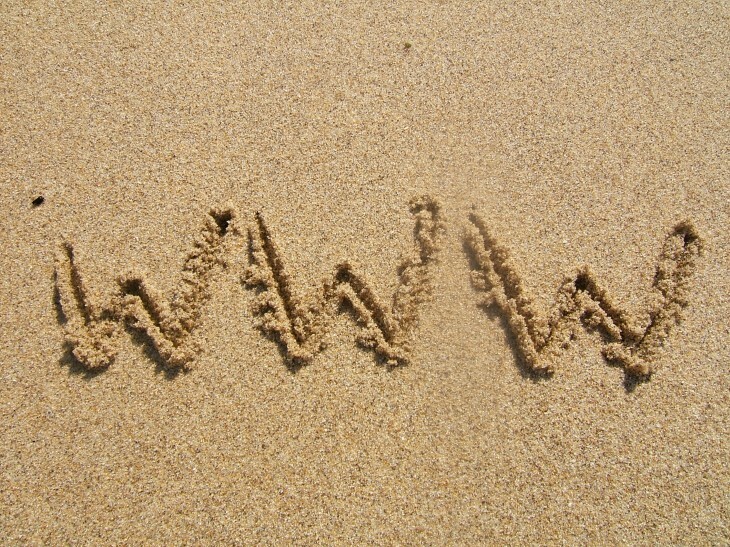 IE8 lost 0.16 percentage points, but it’s still the world’s most popular browser at 23.38 percent. IE7 was down 0.12 percentage points and IE6 fell a nice 0.36 percentage points. Everyone can’t wait for it to fall below the 5 percent mark, but that won’t happen till sometime later this year (and China is delaying things). 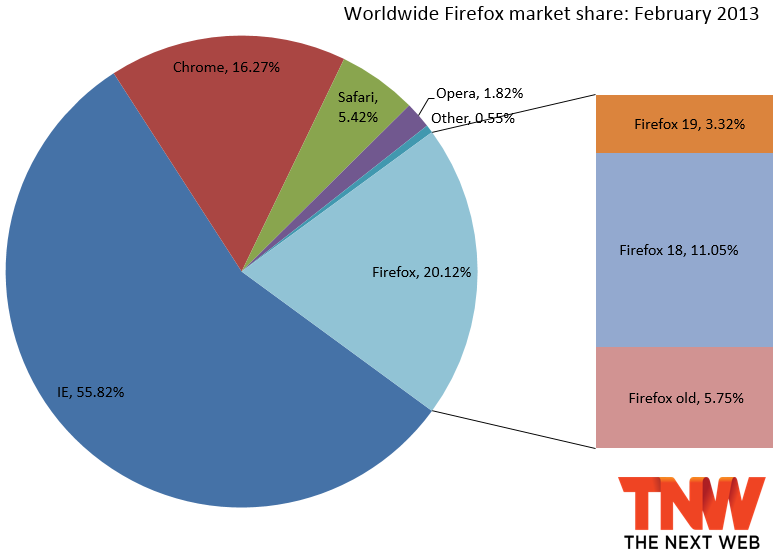 At 20.12 percent, Firefox continues to hover at the one-fifth-of-the-market mark. Firefox 19 managed to grab 3.32 percentage points, which naturally would have been higher if the browser was available for a full month. Firefox 18 grabbed 2.77 percentage points, while all the older versions lost share: Firefox 17 fell 5.00 percentage points, Firefox 16 was down 0.26 percentage points, and Firefox 15 lost 0.07 percentage points. 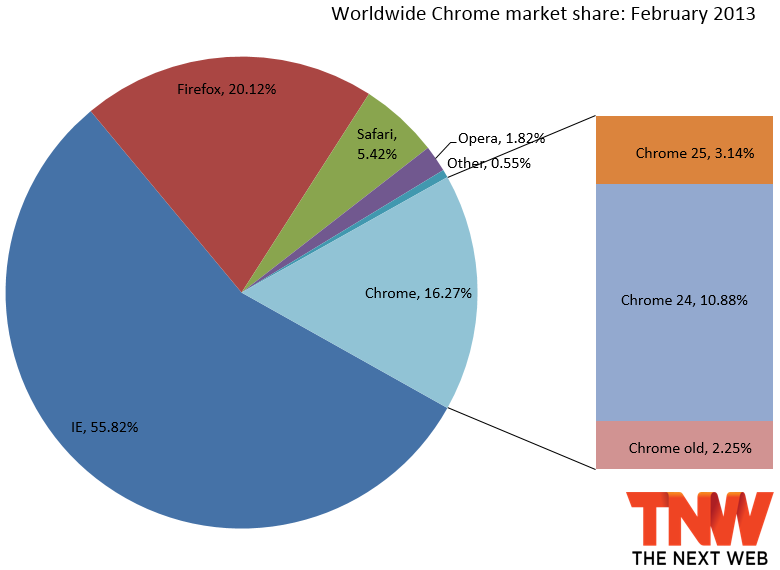 At 16.27 percent, Chrome took a serious beating in February. We haven’t seen the browser at the 16 percent mark since September 2011. Late last year, it saw three months of losses in a row, and now it’s two for three again after its losses in January. Nevertheless, Chrome 25 grabbed 3.14 percentage points, while Chrome 24 grabbed 2.18 percentage points. Chrome 23 was down 6.13 percentage points and Chrome 22 fell 0.12 percentage points. As we already mentioned, new versions of Firefox and Chrome were released two days apart this month. Thanks to Mozilla’s and Google’s automatic updating systems, the majority of their respective users will be on Firefox 19 and Chrome 25 by the end of March. While we’ve been waiting for Chrome to pass Firefox for a while now, it’s becoming less and less likely. February seems to be just a blip, though this is just speculation right now. IE9 will soon pass IE8, taking the crown as the world’s most popular browser version, and hopefully IE10 will pass IE7 and IE6. Nevertheless, for February 2013, StatCounter listed Chrome as first with 37.09 percent market share, IE in second with 29.82 percent, Firefox in third with 21.34 percent, Safari with 8.60 percent, and Opera with 1.22 percent. The only part everyone agrees on is that Safari and Opera are not in the top three.